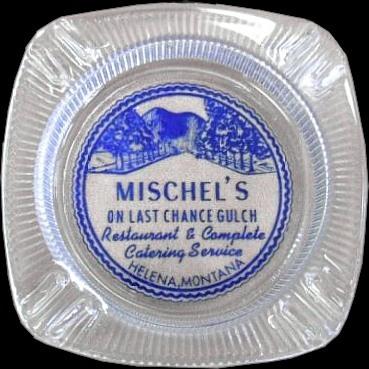 Ashtray from Mischel's Restaurant on Last Chance Gulch. Mischel's was evidently quite short-lived, appearing in newspaper archives only in 1959-1960. It was located at 20 N. Main, the former home of the noted Weiss Cafe. It was operated by David E., Florian, and Benedict Mischel. By 1961, the location was known as Jim's cafe.